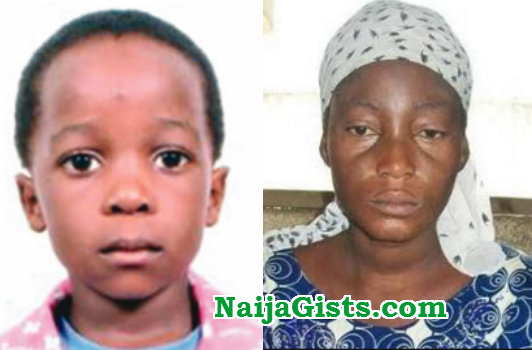 4-year old Master Steve Kanu, who was abducted by suspected kidnappers from his parents’ home in Abeokuta, Ogun State, has been rescued alive in Nsukka, Enugu State. The toddler was said to have gone to open the gate of his father’s compound at the Laderin Estate, Abeokuta, in the evening of November 2 when he was abducted. But on Monday, the state police command said the boy has been rescued safely, while Kenechukwu Amoke, Anayo Amoke, Oluchi Asadu (female) and Maureen Uchenna (female), have been arrested in connection with the abduction by operatives of the Anti – Kidnapping Squad attached to the command. The state’s Commissioner of Police, Abdulmajid Ali, who paraded the suspects before journalists at Eleweran, the headquarters of the state police command, said the little boy was rescued alive on November 19. The police commissioner added that Maureen, a nurse who had worked at the victim’s dad’s hospital, carried out the kidnapping in connivance with her boy friend, Obinna Amoke, who is now on the run. She is not a nurse, she is an attendant.